And if you’re new to the business, or if you’ve recently redone your photography logo, you probably have asked this question to a large handful of friends, family and other photographers. Come on. Admit it. Everyone cares what his or her own photography logo looks like. It’s like asking, “how does my hair look?” after a trip to the salon. You want to hear the gushing comments about how beautiful and glorious it is. But a great hairdo doesn’t guarantee to land you a prom date. And I can promise you one thing: Your logo will not land you more clients. A photography logo is but a tiny part of generating clients, and I think that’s where so many people get confused about branding, marketing and how the two connect. So let me break down the basics of branding for you. The real question is: what isn’t a brand? Every single time you have any level of interaction with a company, you are touching that company’s brand. So for your business, your photography logo is just one teeny tiny piece of your brand. If that’s a brand, then what the heck is marketing? Marketing is what attracts people to you. People don’t know you very well at all when they experience your marketing. Once they step closer, they touch your brand. They might literally be touching your brand if they’re holding your business card or metaphorically touching it if they only got your number from a friend and, suddenly, they’re speaking to you before they’ve even seen your photography logo. In the case of the latter, they’re experiencing your brand over the phone. Marketing is finding out about a hot girl or guy needing a prom date. Branding is when you see what he or she looks like, smells like, talks like and walks like. What makes a good brand? First and foremost, you want to establish a consistent brand. You cannot be the “crazy fun photographer” and the “hopelessly romantic photographer” at the same time. People will become confused about who you are, and people look for clarity when deciding to spend money. If potential clients get confused, more times than not they’ll shop elsewhere. So, you have to take a hard look at the list above under “What is a brand?” and highlight the ones that lack consistency. If you notice things that contradict one another, then it’s time to honestly evaluate what type of brand you’re aiming to portray and then “tidy up” the things that aren’t consistent. How do I figure out what brand I want? 1. The easiest way to determine the brand you want is to describe the type of person you are. When you’re a soloprenuer, it is extremely difficult to be a brand that isn’t part of you as a person. So if you want your brand to exude fun because you’re the life of every party, then that makes perfect sense! On the contrary, if you’re a hopeless romantic who thinks love conquers all, then passion and romance can be a huge part of your brand. There is a saying, which goes “there are riches in niches.” And a large part of why this is true is because when you don’t create a niche for your business to live in and you try to be too many things (ie too many brands) at once, you stand to lose a lot of money. 2. The second step toward figuring out your brand is to think of the ideal buyer(s) who will be spending gobs and gobs of money with you. 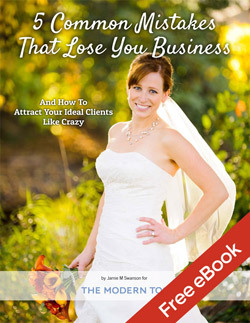 If you picture a few of your ideal clients, what type of brand would attract more people like that to your business? If you feel pretty good that the brand you want to create will also be appealing to your potential customers, then you’re really onto something. How do I start creating my new brand? The right answer is: anywhere and everywhere. But obviously you can’t close up shop for a month to work on your branding. So just take it one step at a time. My recommendation is to work on the things that are grossly inconsistent first. While this might seem daunting, you will make the most impact on brand clarity as a result. For example, if your website is a complete mismatch to the new brand you’re creating, get started on it and work on a piece of it each week. When your new website launches, it will be much easier to clean up the ancillary other things that still need to be consistent. How do I know when I’m done? Rome wasn’t built in a day. And truthfully, brands evolve over time, too. Every single improvement or revision you make is one step closer to brand consistency. If you’re reading this and you’re fairly new to the industry, you have a huge advantage. You can start things off on the right foot with a clear and consistent brand. You will likely never be done branding your business. While the major projects, such as your website, photography logo or printed materials, might be completed, you will continue to have new marketing opportunities and new interactions within your business to consider from a branding perspective. Clarity and consistency helps to make everything easier and feel like second nature as time moves on. Wish you knew all of this from day one instead of now? I recently wrote a brief e-book titled: The Art Of A Photo Business: What Every Photographer Wished They Learned Before Starting Their Photography Business. It contains marketing advice, business tips and miscellaneous motivational “umph” for every single photographer seeking a better way to approach their business. The Modern Tog readers get it for just $7 until 4/30/13. Buy it by clicking here and use coupon code SL26Y.